Version 1.0 adds "the story" and more. 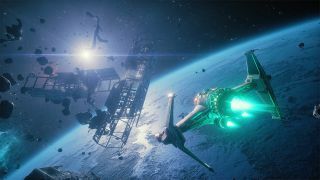 Rockfish Games, the developer of rogue-ish space-'em-up Everspace, announced back in April that the game would break free from the orbit of early access on May 26. However, it actually launched on May 25—24 whole space-hours early. You might be wondering how version 1.0 differs from the early access builds of the game, and if so, you'll be interested to hear that it's added a bunch of trifling features such as "the story". Also, achievements, VR support, and some other tweaks that are perhaps a bit less exciting. One of the bigger changes for Everspace v1.0 is the removal of scanning probes, an action that Rockfish elaborates on in the patch notes. "We watched a lot of streams and videos of people playing EVERSPACE and noticed that crafting/using scanning probes has become too obligatory. The routine would be to craft and use a scanning probe at the beginning of every location which is neither fun nor does it promote explorative gameplay. We realized that a lot of gameplay elements would not work the way we intended, i.e. cloud fields, comm hubs, jump suppressor signals and many more. On the other hand, not being able to craft scanning probes (e.g. due to a lack of gas) would result in frustration, so increasing the crafting costs was not and option. "Our solution: Remove scanning probes completely, add radar memory (so that scanned objects will remain on the HUD), increase the amount of comm hubs and introduce a new device, the sensor relay which increases the ship's sensor range. "With these changes in effect, we noticed a huge improvement in gameplay, shifting the approach towards risk/reward driven exploration rather than dully working off HUD markers one after another."